I have a pack of friends who write books for young-adult and middle-grade readers (all of whom you should read). This is not just because I’m incredibly blessed to know smart, talented people, but also because this is Minnesota and you can’t throw a lutefisk without hitting someone who writes books for people who aren’t yet considered grown-ups. Seriously, this state is filthy with young-adult, middle-grade, and children’s writers*. Because of this I hear about a lot of fabulous young-adult writers both old and new. However, none of them have ever spoken about one of my very favorite young-adult writers, M.E. Kerr. As a teen and young-adult, I gobbled up every M.E. Kerr book I could find. Some of my favorites include Him She Loves, Gentlehands, and I’ll Love You When You’re More Like Me. But my all-time favorite is I Stay Near You: One Story in Three, which along with The Count of Monte Cristo was my favorite book until I read A Prayer for Owen Meany. 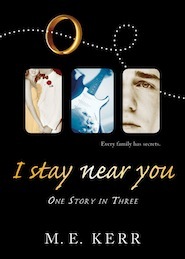 Oh, I get all teenaged and sigh-y when I think about I Stay Near You, a book that follows three generations of the doomed Cone-Powell family. I’ve probably read this book four or five times in my life. I recently reread it as part of the Re-evaluating Personal Artifacts project I’ve started as a ramp up to my FORTIETH! birthday. The book starts off in the pre-war 40s of upstate New York where we meet Mildred Cone, a poor, harp-playing loner who is shunned by most the kids in her class not just because she’s poor and she plays the harp but because Mildred’s a pit prickly. The only thing Mildred hates more than when her peers shorten her name to Millie are the super rich Storms who live on top of a hill in a mansion called Cake. But things change when Mildred falls in love with the youngest Storm, Powell over the summer. She returns to school beautiful and exotic. She wear an expensive gold ring around her neck with Basque writing that says “I Stay Near You.” Love changes Mildred and she reads scandalous poems by Edna St. Vincent Millay in English class and plays popular songs on her harp during the recital. The kids are mesmerized and Mildred takes Laura into her confidence. It’s Laura who tells us the tragic love story of Mildred and Powell that ends as WWII breaks out. Next, the book jumps to the sixties where we find Vincent Haigney, Mildred’s teenaged son who longs to be a rock and roll star. Vincent’s in love with the girl whose family runs the local pawn shop. Mildred’s not a fan of the girl she dubs trashy. But Vincent doesn’t let his mother’s distaste stop his relationship and he promises Joanna the mysterious gold ring in his mother’s drawer as soon as he gets it on his eighteenth birthday. Things don’t end well. Finally, we land in the eighties where Powell Storm Haigney, Mildred’s grandson, is writing a letter to his dad, rockstar Saint Vincent (huh, I wonder if St. Vincent ever read this book). P.S. is a little pissed off and chronicles the ways in which his father has let him down time and time again. This last third, is easily my favorite part of the book not only because it features a lot of pop culture, but also because Kerr slowly reveals what happened to Vincent and Mildred through P.S.’s eyes. It’s really smart and clever and probably why I loved the book so much as a teenager and why I still appreciate it now. Though I do have to admit there was a bit of eyerolling when Vincent said about his mother, “She still looked good, too, even at thirty-four.” Yeah. When you spend most of your teen years reading the predictable pap that is Sweet Valley High (not that I didn’t love that pap), I Stay Near You was so wholly different I couldn’t help but fall for it. *As I was writing this I saw the link for The Loft’s 2012 Children’s and Young Adult Literature Conference float across Facebook and if you have any interest in writing for not-yet-grownups, you should check out the conference.